I was off and away. 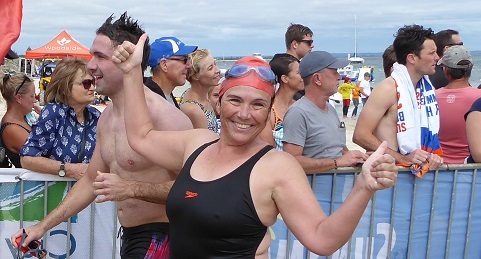 So yes, I managed the 3.6km swim, in a time of 77 minutes and, as you might guess from the photo, I was left elated but also a wee bit exhausted. the water was rougher than expected – a storm front had come through in the days leading up to the swim, and apparently these were the worst conditions there’d been in the race’s history. But my training paid off and I stuck to my rhythm – the same rhythm I’ve tried to use in the poem. So, although I swallowed about half the ocean, I felt pretty good doing it. Good enough that I’ll be going back for another go next year. Have a great Poetry Friday. The roundup today will be hosted by Check It Out, so if you want lots more poetry goodness, head over there to see what everyone else is posting. Woohoo! That’s awesome, Sally!!! A photo/poem pairing for your wall… or at least for your refrigerator… and definitely one for the scrapbook, too! HOORAY SALLY! Glad you made the swim, loved your rollicking poem too! What a brave soul you are! And your pride of accomplishment shows. Here’s to many many more swims! WOW – that is truly worth celebrating, Sally. I’m in awe, actually. Love the rhythm of your poem, and I can see kids latching right onto the idea of the rhythm of your swimming strokes and the rhythm of your words mirroring each other! You’re such an inspiration, all around! Wow, wow, WOW! Yay, YOU! You are TOTALLY one of my swimming heroines now! Thanks Jone. I’m still smiling. Congrats to you, Sally! Love your verse, too! Thanks Jane. yep, reaching one goal definitely inspires me towards meeting the next one. How exciting! Congratulations, Molly. I knew you could do it! Thanks Linda. I think the faith everyone had in me got me over the line. Congratulations! I am truly impressed. With the water even more daunting, you were “off and away”! Congratulations, Sally. That’s just wonderful! Love the poem, and the picture! Thanks Linda. It’s lovely to share my excitement with friends from around the world. Sally, not only did you meet your challenge but you provided a rhythmic retelling of it. Congratulations! Congrats to you! Woo-hoo! Nice poem to memorialize the day. Thanks Brenda and thanks for dropping by. Wow! An amazing accomplishment. Congratulations! WOW! FANTASTIC! I love seeing that you made your goal….and in verse. You inspire me…..to get of my, um….duff! Great job on the swim and fabulous way to share. Have a great week. Thanks Linda. Now on to the next goal 🙂 You have a great week too. Hip Hip Hooray is right!! Well done, Sally!